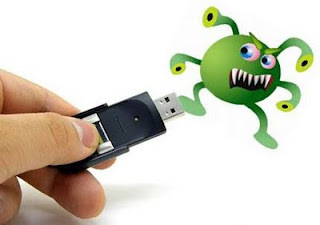 Tips How To Protect Your USB Drive From All Virus !!!!!!! When you plug in a USB drive stick into your system, the Autorun feature initiates automatically. If your USB contains any virus, it’ll use the Autorun feature to infect your computer. To protect your computer, disable the Autorun feature.You can disable the Autorun feature via the Control Panel. Alternatively, you can use antivirus software to disable and enable the Autorun feature whenever you want. Additionally, these USB blocking softwares allowsystem administrators to specify which removable storage drives users can access. Right-click the desired CD-ROM and select Properties from the menu. Select each item from the pulldown list and for the Action to perform, select "Take no action" to disable autorun, or pick the apporpriate action to take if enabling autorun. Viruses are sometimes created via damaged documents. If you are transferring a set of files to your USB drive, make sure the transfer is complete before you eject the device. Always use the Safely Remove Hardware feature of Windows OS. This is because partially transferred or damaged files can in turn corrupt other files on your USB drive. 0 Respones to "Tips How To Protect Your USB Drive From All Virus !!!!!!!"